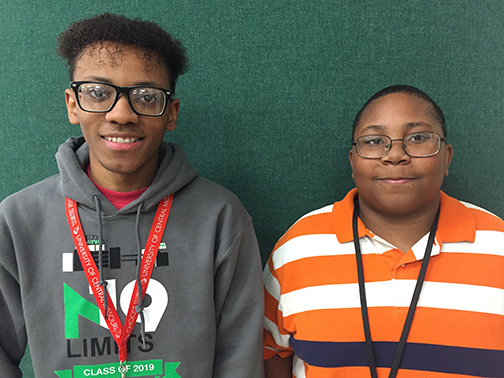 Pattonville senior Micah Lee and sophomore Tony Washington were among 22 students in the St. Louis region selected by competitive audition to participate in the Monsanto Artists-in-Training program sponsored by the Opera Theatre of St. Louis. This is Lee's third year being chosen for this honor. In addition, internationally and nationally recognized artists will be in residence with the program, and students will be able to attend master classes with these professional singers and teachers. They also participate in retreats and college tours and attend performances by Opera Theatre of Saint Louis, the St. Louis Symphony, the St. Louis Black Repertory Theatre, the St. Louis Repertory Theater, Jazz St. Louis, Dance St. Louis and more. Participants perform two recitals each year, including a public spring recital in April at the Sheldon Concert Hall in St. Louis. During this event, more than $12,000 in scholarships for college or further vocal study will be awarded. Melynda Lamb is the students' choir director at Pattonville. Micah Lee, left, and Tony Washington were chosen to participate in the Artists-in-Training program of the Opera Theatre of St. Louis.